Inflammatory bowel diseases (IBD) are a group of chronic relapsing conditions of unknown etiology. The phenotypes include Crohn's disease (CD), ulcerative colitis (UC), and IBD-unclassified (IBD-U). The highest incidence is in Western populations. However, recent reports from developing countries indicate increasing incidence and time trends., Early diagnosis of IBD leads to timely management and better outcomes. Conversely, a delay in the diagnosis is associated with delayed therapy resulting in continued disease activity which not only results in prolonged suffering that affects the quality of life,, but also complications requiring early surgery., Most of the literature on risk factors and health consequences of long diagnostic delays of IBD are about adults and Western populations. There is a scarcity of literature in children and an absence of information from non-Western populations. In this study, we aimed to report on the pattern of diagnostic delay including risk factors for long delays in diagnosis in a cohort of Saudi children with IBD. The study population consists of a cohort of Saudi children with IBD, diagnosed and managed in 12 gastroenterology centers across the Kingdom of Saudi Arabia (KSA). The data were collected retrospectively from the available physicians' notes that included demographic information, dates of onset of symptoms related to IBD, dates of presentation to physicians, and dates of final diagnosis. The diagnosis of CD, UC, and IBD-U was based on standard clinical, laboratory, imaging, endoscopic, and histopathologic criteria. These retrospective data collected from children who presented from 2003 to 2012, were supplemented by data obtained from children enrolled in a prospective pediatric IBD study from 2011 to 2018. Total diagnostic delay was defined as the time from the onset of symptoms related to IBD to the final diagnosis by gastroenterologists. This total delay was divided into two intervals. Interval I, called “patient-related delay” was defined by the duration of symptoms from the onset to physician consultation, and Interval II, called “physician-related delay” was defined as the duration of the illness from the consultation of physician to final diagnosis. In this study, physician refers to gastroenterologist. Long diagnostic delay was defined as delay in diagnosis greater than 75th percentile of the overall delay. The data were analyzed by using Statistical Package for Social Studies (SPSS 22; IBM Corp., New York, NY, USA). Data distribution was analyzed using normal QQ-plots. Nonparametric data were expressed as median plus interquartile ranges (IQR) and categorical data were expressed as percentages. The Kruskal–Wallis test was used for nonparametric data. Univariate and multivariate logistic regression was used to assess the risk factors associated with long (>75th percentile) delays in diagnosis for CD and UC. A P value <0.05 was considered statistically significant. This report is based on data from the national study of the characteristics of IBD in Saudi children, reviewed and approved by the Institutional Review Board, College of Medicine, King Saud University (No. 10/2647/IRB). For the prospective data, informed consent and/or assent, were obtained before enrollment in the study. Data on diagnostic delay were available for 441 children with IBD including 240 for CD (54.4%), 183 for UC (41.5%), and 18 for IBD-U (4.1%). However, because of the small numbers, the IBD-U data were not analyzed. These include prospective data from 32 and 28 children with CD and UC, respectively. The demographic and clinical profiles of the children are shown in [Table 1], illustrating the younger age of onset, presentation, and final diagnosis in female children with UC. [Table 1] also illustrates the higher consanguinity and positive family history of IBD in children with CD. The location of CD with the ileocolonic (L3) location and the non-constricting non-penetrating behavior (B1) was the most common, occurring in 48.4% and 68.1% of the patients, respectively, and for UC, pancolitis was the most common presentation, occurring in 48.8% of the patients. Comparison of the total diagnostic delay in children with CD and UC is presented in [Figure 1], indicating significantly longer total diagnostic delay in children with CD: 8 months (IQR 4–24 months) than in those with UC, 5 months (IQR 2.1–8.8 months) (P < 0.001). Analysis of stratification of diagnostic delay showed that, in children with CD, the median and IQR of Interval I (duration from onset to physician consultation) was 6; 1–24 months and Interval II (duration from physician consultation to final diagnosis) was 0.6; 0.4–3.4, indicating significantly longer interval I (P < 0.001). Similarly, in children with UC, the median and IQR of Interval I was 2.4; 0.3–7 months and of Interval II was 0.8; 0.55–3.9, indicating significantly longer interval I (P = 0.008). The percentile distribution of the diagnostic delay is detailed in [Table 2], indicating that 50% of the children with CD and UC were diagnosed within 8 and 5 months, respectively, after the onset of symptoms. However, 75% of the children with CD and UC, were diagnosed within 24 and 8.8 months, respectively, after the onset of symptoms. Multivariate analyses of risk factors for long delays in the diagnosis of CD and UC are depicted in [Table 3]. Although positive family history and male gender were protective, the only significant risk for long diagnostic delay in the diagnosis of CD was the ileal location at presentation (P = 0.040); whereas the age at onset more than 120 months (10 years) was considered significant in patients with UC (P = 0.034). In developing countries such as KSA, IBD was long considered a relatively rare disease in children. However, recent multicenter reports revealed lower incidence, but with an increasing trend, and clinical profiles similar to descriptions in Western literature.,,, To our knowledge, this is the first report on the pattern and risk factors of long delays in IBD diagnosis in children, from a non-Western population with a different education and culture context. The finding of significantly longer diagnostic delays in children with CD than UC is similar to reports from children and adults as well. In our study, the median overall delay from the onset of IBD-related symptoms to the final diagnosis was 8 months for CD and 5 months for UC. Both of these are longer than those reported in Belgium (5 months for CD and 3 months for UC) and Italy (4 months for CD and 2 months for UC). However, our data are closer to adult literature reporting median diagnostic delays of 9 and 4 months for CD and UC, respectively. Stratification of diagnostic delay is important to define areas of priorities for action to reduce diagnostic delay. This study revealed that most of the delay occurred in the duration of time from onset of IBD-related symptoms to physician consultation (Interval I) and that this interval was significantly longer for children with CD (P = 0.001). This finding contrasts with results of adult studies indicating longer delays from the physician consultations to final diagnoses., For children, there were only two studies reporting stratification of diagnostic delay. In a national cohort study of Swiss children, “physician-related” diagnostic delay was significantly longer than “patient- related” delay. However, our findings are in line with a recent single center report from Canada which concluded that the time from the onset of symptoms to physician referral “patient-related delay”, was the greatest contributor to overall diagnostic delay. This discrepancy between studies in the degree of contribution of Interval I or Interval II to long diagnostic delay is most probably related to the type of referral systems which is variable in different countries. Accordingly, Interval I “patient-related” may be truly related to patients who seek medical advice late in the development of symptoms, or may be caused by delay in referral from general physicians, family physician or pediatrician to gastroenterologists. Further studies of the referral system are needed to identify the causes of long delay, in order to focus on implementation of measures to reduce long delays in the diagnosis of IBD. In the meantime, efforts to reduce the diagnostic delay should include measures at 3 levels: (1) Public education on how to identify early symptoms and signs of IBD in order to seek medical advice early. (2) Education of general physicians, family physicians, and general pediatricians to ensure early referral to gastroenterologists. (3) Review the referral system to allow prompt referral of patients to concerned gastroenterologists. The percentile distribution of diagnostic delay in this cohort revealed that 50% of the children with CD and UC were diagnosed within 8 and 5 months, respectively. However, only 75% of the children with CD and UC were diagnosed within 24 and 8.8 months, respectively. This is much longer than the 8 months (for CD) and 7 months (for UC) reported in a pediatric study, but consistent with literature about adult patients with CD and UC,,, indicating that about 25% of the children with CD suffer from long diagnostic delay with increased risks of complications. Identification of risk factors associated with long diagnostic delays is another important variable that can help improve recognition of the disease and early referral of patients to gastroenterologists, in order to reduce long delays in diagnosis of IBD. In this study, the identification of ileal location as a significant risk factor in CD, and an age greater than 10 years at onset as protective in UC, although well known in adult literature, had not been reported so far in children and should help increase the index of suspicion of IBD and early referral. In this cohort of Saudi children, long diagnostic delay in IBD was mainly due to the longer delay in physician consultation. Further studies of the referral system are needed to identify the causes of long delay to focus on implementation of measures to reduce long delays in the diagnosis of IBD. In addition, the identification of ileal location of CD as a risk factor, and age of onset of UC above 10 years as protective, for long delay should help early recognition and referral to gastroenterologists. The authors extend their appreciation to the Deanship of Scientific Research at King Saud University for funding this work through Research Group No (RGP-1436-007). The Deanship of Scientific Research, King Saud University, Riyadh, Kingdom of Saudi Arabia. Grant number RGP-1436-007. Kappelman MD, Moore KR, Allen JK, Cook SF. Recent trends in the prevalence of Crohn's disease and ulcerative colitis in a commercially insured US population. Dig Dis Sci 2013;58:519-25. Benchimol EI, Fortinsky KJ, Gozdyra P, Van den Heuvel M, Van Limbergen J, Griffiths AM. Epidemiology of pediatric inflammatory bowel disease: A systematic review of international trends. Inflamm Bowel Dis 2011;17:423-39. Knowles SR, Keefer L, Wilding H, Hewitt C, Graff LA, Mikocka-Walus A. Quality of life in inflammatory bowel disease: A systematic review and meta-analyses-Part II. Inflamm Bowel Dis 2018;24:966-76. Kim S, Park S, Kang Y, Choe BH, Kang B, Kim JE, et al. Can we estimate quality of life in pediatric inflammatory bowel disease patients? An Asian multicenter study. J Pediatr Gastroenterol Nutr 2018;68:45-9. Nguyen VQ, Jiang D, Hoffman SN, Guntaka S, Mays JL, Wang A, et al. Impact of diagnostic delay and associated factors on clinical outcomes in a US inflammatory bowel disease cohort. Inflamm Bowel Dis 2017;23:1825-31. Nahon S, Lahmek P, Paupard T, Lesgourgues B, Chaussade S, Peyrin-Biroulet L, et al. Diagnostic delay is associated with a greater risk of early surgery in a French cohort of Crohn's disease patients. Dig Dis Sci 2016;61:3278-84. Levine A, Koletzko S, Turner D, Escher JC, Cucchiara S, de Ridder L, et al. European society of pediatric gastroenterology, hepatology, and nutrition (ESPGHAN) revised porto criteria for the diagnosis of inflammatory bowel disease in children and adolescents. J Pediatr Gastroenterol Nutr 2014;58:795-806. El Mouzan MI, Saadah O, Al-Saleem K, Al Edreesi M, Hasosah M, Alanazi A, et al. Incidence of pediatric inflammatory bowel disease in Saudi Arabia: A multicenter national study. Inflamm Bowel Dis 2014;20:1085-90. Saadah O, El Mouzan M, Al Mofarreh M, Al Mehaidib A, Al Edreesi M, Hasosah M, et al. Characteristics of pediatric Crohn's disease in Saudi children: A multicenter national study. Gastroenterol Res Pract 2016;2016:7403129. Al-Hussaini A, El Mouzan M, Hasosah M, Al-Mehaidib A, ALSaleem K, Saadah OI, et al. Clinical pattern of early-onset inflammatory bowel disease in Saudi Arabia: A multicenter national study. Inflamm Bowel Dis 2016;22:1961-70. AlSaleem K, El Mouzan M, Saadah OI, AlSaleem B, Al-Hussaini A, Hassosa M, et al. 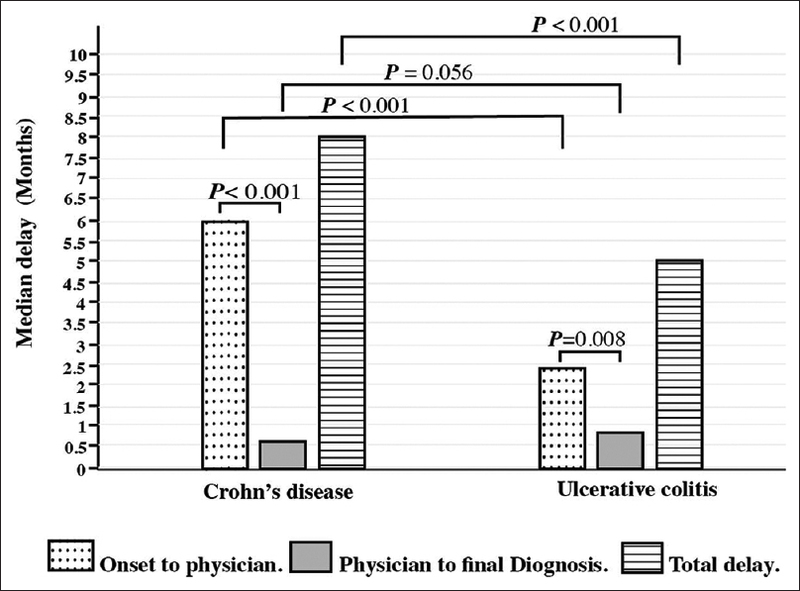 Characteristics of pediatric ulcerative colitis in Saudi Arabia: A multicenter national study. Ann Saudi Med 2015;35:19-22. De Greef E1, Mahachie John JM, Hoffman I, Smets F, Van Biervliet S, Scaillon M, et al. Profile of pediatric Crohn's disease in Belgium. J Crohn's Colitis 2013;7:e588-98. Castro M, Papadatou B, Baldassare M, Balli F, Barabino A, Barbera C, et al. Inflammatory bowel disease in children and adolescents in Italy: Data from the pediatric national IBD register (1996-2003). Inflamm Bowel Dis 2008;14:1246-52. Vavricka SR, Spigaglia SM, Rogler G, Pittet V, Michetti P, Felley C, et al. Systematic evaluation of risk factors for diagnostic delay in inflammatory bowel disease. Inflamm Bowel Dis 2012;18:496-505. Schoepfer AM, Vavricka S, Safroneeva E, Fournier N, Manser C, Frei P, et al. Systematic evaluation of diagnostic delay in pediatric inflammatory bowel disease. J Pediatr Gastroenterol Nutr 2017;64:245-7. Ricciuto A, Fish JR, Tomalty DE, Carman N, Crowley E, Popalis C, et al. Diagnostic delay in Canadian children with inflammatory bowel disease is more common in Crohn's disease and associated with decreased height. Arch Dis Child 2018;103:319-26. Zaharie R, Tantau A, Zaharie F, Tantau M, Gheorghe L, Gheorghe C, et al. Diagnostic delay in Romanian patients with inflammatory bowel disease: Risk factors and impact on the disease course and need for surgery. J Crohn's Colitis 2016;10:306-14. Pellino G1, Sciaudone G, Selvaggi F, Riegler G. Delayed diagnosis is influenced by the clinical pattern of Crohn's disease and affects treatment outcomes and quality of life in the long term: A cross-sectional study of 361 patients in Southern Italy. Eur J Gastroenterol Hepatol 2015;27:175-81.